I must ask aloud: was X-Men Origins: Wolverine really worth mucking up the publishing of what many are already calling the greatest comics story ever told about Wolverine? Probably not. But be of good cheer: Wolverine #72 gets us back on track with "Old Man Logan". To recap: it's been fifty years since "the night the heroes fell" and Wolverine hasn't popped his claws once since. He has relegated himself to being simply "Logan": a pacifist farmer scratching out a meager existence alongside his wife and children in the wastes of California. When the now-blind ex-Avenger Hawkeye approaches Logan with an offer he can't refuse ('cuz Logan is behind on his rent to the inbred offspring of Bruce Banner) the two former heroes take off across a carved-up America plagued with Moloids, Venom-possessed dinosaurs and worse. And then in Part 5 of "Old Man Logan" we found out why it is that Logan renounced violence and threw down the proverbial sword (read my reaction to that issue here). 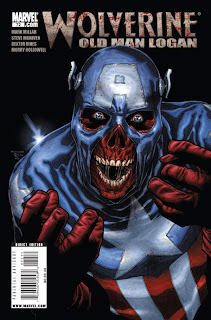 In the last chapter of "Old Man Logan", Hawkeye and Logan finally arrived at New Babylon with their mysterious package, and at last we find out who is calling the shots of this dystopian vision of America: the Red Skull, now the President of the United States. If you've been reading "Old Man Logan" already and have been frustrated by the publishing schedule, rest assured that Wolverine #72 will profoundly reward your patience! The initial scenes in the White House with an even more macabre Red Skull and how he's still gloating over his victory a half-century earlier might be some of the most nightmarish images in Marvel history. I dare not say anything else about this issue folks, because if you've been keeping up this far then you really owe it to yourself to go into it cold. But it's a wallop of a read and the final pages will make you forget everything that delayed this issue from coming out. Oh yeah, you might wanna try reading it a little slower and indulge your senses all the more, because "Old Man Logan" won't be wrapping up until a double-sized issue coming out in September at the earliest. But don't let that stop you from discovering the best Wolverine tale in many a moon and maybe ever: "Old Man Logan" is a must-read whether you're a rabid comics fan or a casual reader.